And I’m back from a bit of an anniversary break with 4 coffees from 2 different roasters, and 3 exciting ones from Intelligentisa for anyone to order and taste along. Saying goodby to Elida Natural from @dragonflycoffee - I think I have this one nailed at 18:34-36g in 30s +2s preinfusion at 199*F.
The Elida Estate is one of the most well known, “brand name” farms in the coffee world, often showcasing their high quality coffees in a variety of processing methods from Panama. This one drank more like a rich, naturally processed Ethiopian coffee with rich deep chocolate covered berry like fruit sweetness and texture, with just a hint of welcomed acidity. Brewing it cooler and faster helped keep it from being a chocolate bomb, and preferred shots were pulled at 1:2 ratios in 30s plus 2s preinfusion at 199*F. This coffee is just plain old good for any type of coffee drinker or brewing method. $18 for a 12 ounce bag here. Getting close with Ethiopia Yirg Natural from @dragonflycoffee - I'm targeting 18g : 40g in 30s +2s preinfusion for that big clove note! 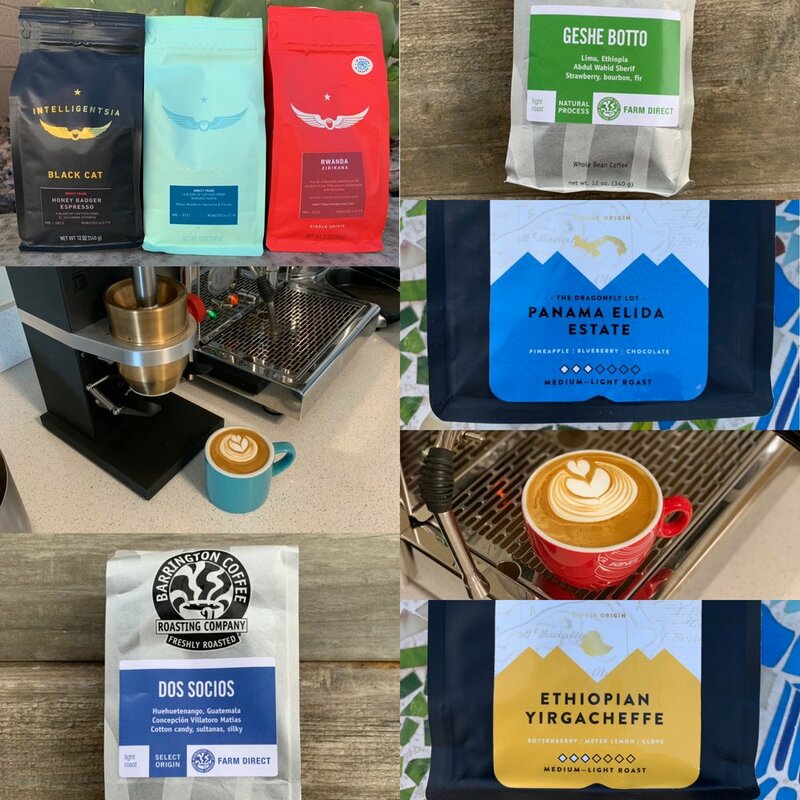 Another just plain classically great specialty coffee, and somewhat similar to the Elida in some respects, is this naturally processed offering from the Yirgacheffe region of Ethiopia. This one had a big clove spice note that lingered, particularly as espresso, and was again very versatile for any brewing method I threw at it. I enjoyed this one pulled slightly longer than the Elida at 18g in an 18g VST basket to 40g out in 30 seconds to highlight that sweet spice characteristic. This coffee didn’t particularly have a distinct fruit note profile, but was made interesting by that distinct exotic spice note. This is another great buy of a solid coffee at $18 for a 12 ounce bag here. Described as, “Dry floral aroma with flavors of blueberry, sultanas, cotton candy, chocolate covered cherries and a spice note of cumin. Rounded acidity and silky smooth mouthfeel,” my first go with Barrington Coffee Roasting Company had a big description, that might have brought unreasonable flavor expectations since they were largely describing the dry aromas. The silky component was absolutely nailed brewed and as espresso, and this coffee was certainly good, I just couldn’t pick out many distinct flavors beyond the great aftertaste silky texture. This may sound somewhat negative, but another way to think about it, which I think is more the case, is that it is a very balanced coffee that really doesn’t shine in any particular area, and comprises an overall great cup without too much thinking. $18.45 for a 12 once bag with free shipping over $50 here. Geshe Botto is a classic natural Ethiopian, and a more bass heavy one at that. I was intrigued by the described undertones of “bourbon, oak, and fir” and they’re absolutely correct. The coffee definitely has some of the trademark fruit and chocolate covered berries upfront, but finishes with a more classic Northern Italian espresso that just coats your mouth and lingers in the best way for half an hour or more. It’s not smoky or roasty, but truly kind of a bourbon-y rich sweetness, this is as espresso aiming for 1:2 ratios in about 30s with 3s preinfusion or so at 201*F.
This rich bass note element had me confused at first thinking I was just brewing/pulling the coffee too hot or too slow, but when I sped up brew times and extractions and used cooler water temps, I did start to get some underextracted notes. Aim for around 201*F or maybe slightly higher when brewing and 3:00 for a 23.75g : 380 V60 brew or 30s + 3s preinfusion for espresso. Because of this richness, this is a great coffee for milk drinks as well. $19.45 for a 12 ounce bag here. Honey Badger, $18.00 - will be working in throughout. I’m particularly excited for Persephone and Honey Badger as they both bring together some exciting regions that will hopefully be bigger than the sum of it’s parts. As always, thanks for reading, if you have any upcoming suggestions, ideas, or coffees I should try, please feel free to reach out or comment below!